SQUARE ENIX® announced today that the mobile RPG DISSIDIA® FINAL FANTASY® OPERA OMNIA™ achieved one million total downloads worldwide in its first month following launch. In celebration of this achievement, all players who log into the game before March 14 at 11:59 PM PST will receive 1,000 Gems to help strengthen their characters and continue their adventures. Story Update: Chapter 6 – Players can now recruit FINAL FANTASY V’s Galuf, FINAL FANTASY X’s Wakka, and FINAL FANTASY XI’s Shantotto in this brand new chapter of the OPERA OMNIA story. Armor Token Exchange - Starting March 4, players can obtain Armor Tokens from limited-time character events and exchange the currency for 5-star armor. 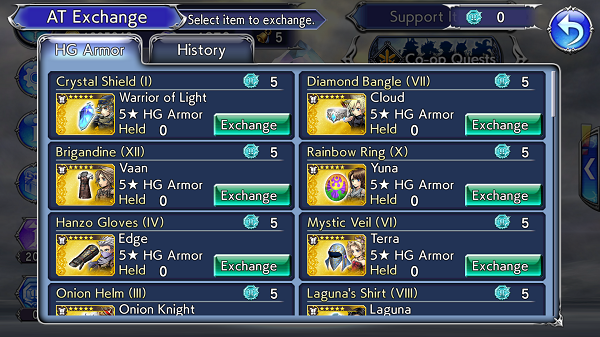 The Armor Token Exchange will initially feature armor for Warrior of Light, Cloud, Yuna, and many more. Character Event: Balthier – Players can recruit the iconic sky pirate from FINAL FANTASY XII and also obtain equipment specific for this newly added ally. Artifacts – Beginning March 4, players can obtain and enhance Artifacts from character event Co-op Quests to grant passive abilities to characters. “World of Illusions: Carbuncle’s Treasures” - Through March 12, players can enter this limited-time dungeon and collect items to power up characters and equipment. Reward Bonuses from Daily Quests – Players can receive double the normal rewards when clearing daily cycle quests through March 12 at 6:00 PM PST. New Weekly Draw - Through March 7, a new weekly draw featuring Vaan, Firion, and Yang will provide an increased chance of obtaining these characters’ weapons. DISSIDIA FINAL FANTASY OPERA OMNIA is available now in the App Store for iPhone and iPad and Google Play for Android devices. For the latest assets, please visit the press site at http://sqex.to/Media.